American Tinning & Galvanizing 2017- Thank you! 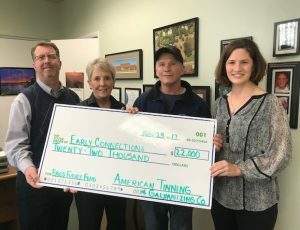 Erie’s Future Fund is grateful to receive a $22,000 Pre-K EITC donation from American Tinning and Galvanizing! Proceeds will help Erie’s Future Fund’s Summer Scholars, a program that provides scholarships for children from low-income families to attend high-quality programs that offer educational activities and nutritious meals during their attendance in the summer months, and funding for scholarships to children from low-income families to attend a high-quality early childhood education program in Erie County during the school year. Pictured left to right: David Bertges, Financial and HR Manager of American Tinning and Galvanizing Company; Robin Scheppner, President and Managing Owner of American Tinning and Galvanizing; Rodney Chiarelli, Vice President of American Tinning and Galvanizing; and Kimberly Beers, Erie’s Future Fund, Scholarship Director. This entry was posted in Uncategorized by mharkins. Bookmark the permalink. © 2019 Erie's Future Fund.